Falafel is a Middle-Eastern culinary food which is a deep fried ball or patty. This fried ball consists of ground chickpeas / fava beans or both and is usually served in a pita pocket or wrapped in a flatbread. 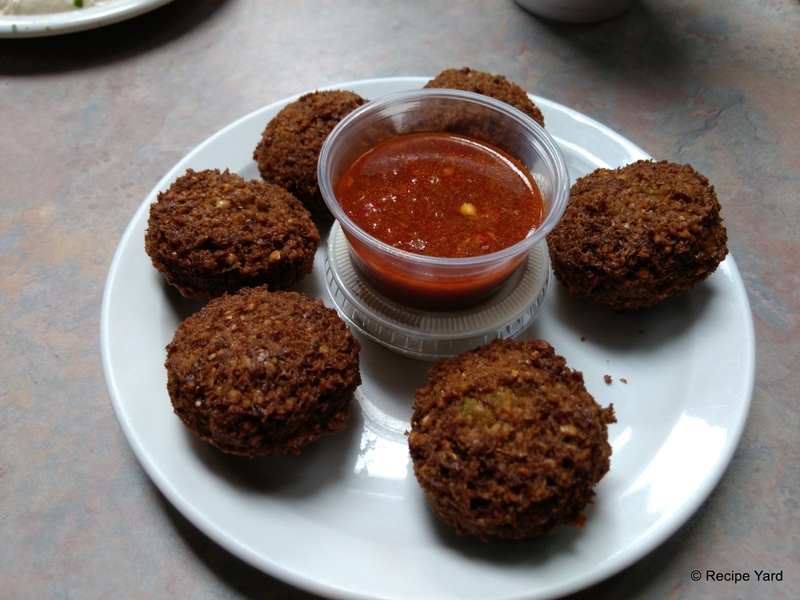 These deep fried balls or patties are also served as appetizer in Middle-Eastern countries. These days falafel is very popular in western countries too including USA and UK. This is an authentic recipe to prepare falafel balls that are perfect to be served as a vegan appetizer or starter. Put a saucepan or pot over medium heat with rinsed and drained chickpeas in it, covered with enough water. Bring to a boil then reduce heat to simmer for 30 minutes. Remove from heat and drain. Allow to cool for 10 minutes. Combine cooked chickpeas with all of the ingredients except oil and dipping sauce in a large mixing bowl. Use a potato masher to mash chickpeas until well combined with other ingredients. Mix everything very well. Put a skillet or wok over medium heat with enough oil in it to heat. Form 2 inch balls from prepared chickpea mixture using wet hands and slightly press them to flatten a bit. Gently drop into heated oil in batches. Do not overcrowd. Fry each batch of flatten or round balls for 3 to 4 minutes from both sides while flipping occasionally or stirring occasionally until golden brown. Drain the fried balls or discs from hot oil using slotted spoon and transfer onto a paper towel lined tray so as to soak excessive oil. Repeat the process to fry more batches of falafel from remaining mixture. Serve hot accompanied with tahini sauce or hummus or any other favorite dip as per choice, enjoy.